Cherrapeno: Thirsty? 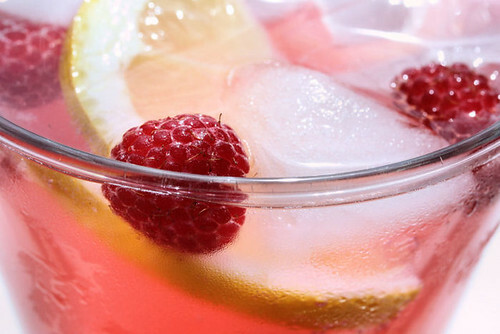 Try a Raspberry Cooler! Thirsty? 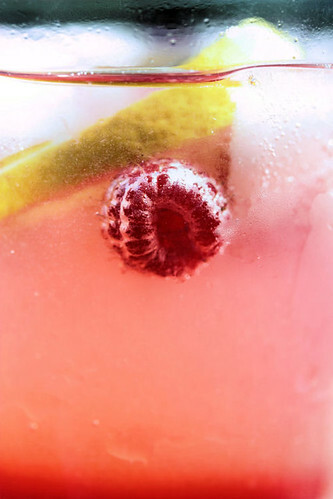 Try a Raspberry Cooler! 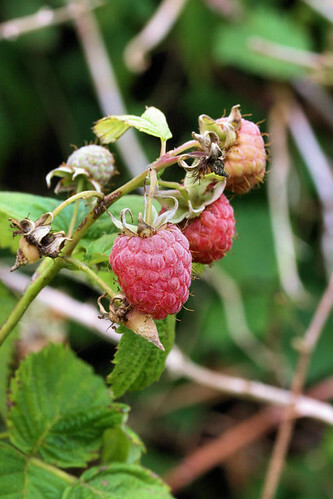 We have more raspberries than we know what to do with lately, and one easy way to use them up is to make a raspberry cordial - a sweet, non-alcoholic fruit concentrate that is diluted down with water/lemonade to taste. This went down a treat in the mini-heatwave we had last week, and is a great way to use up the smaller, softer, more manky raspberries that you might not want in your desserts. Ice and cold or sparkling water/lemonade to serve. See note at end. 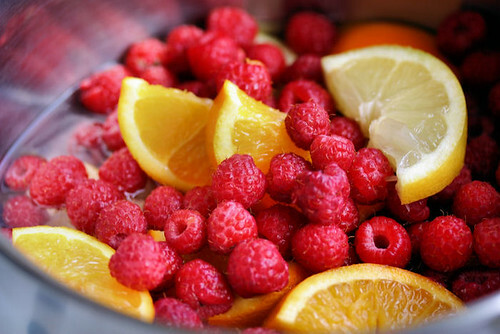 Put all the ingredients (raspberries, sugar, lemon, orange and 225 ml water) in a large saucepan and bring to the boil, stirring often. Leave to cool. Pour through a sieve, pressing the mixture down well with a spoon to extract all the juices. The syrup can be stored for up to one week in the fridge. To serve, pour a little of the syrup into a glass, top up with water (still or sparkling) and ice. Note: You can also dilute this with lemonade or a mixture of lemonade and sparkling water if you want it less sweet. The lemonade we get here is quite different from that in the US. Ours is a sparkling lemony beverage, and can be replaced with something like 7-Up, Mountain Dew or Sprite. I know what you mean about the raspberies, mine are starting to fall of the canes as they ripen, because I cannot pick them fast enough! This recipe does look rather refreshing. Good for a day like today. What a 'cool' cooler Nic...love it. Yes, it was quite hot last week, wasn't it? Perfect time for this pretty drink. Oh Nic this looks sooooo tempting and refreshing. I just love the pink colour!! These shots of the drink are very nice ! Capture so well the summer feeling ! Mmmm yum - looks a nice drink and I love the pictures too! I love the resolts of your drink!!! Nice pictures. I don't think you can ever have too many raspberries, but I like how you used these. Sounds great. 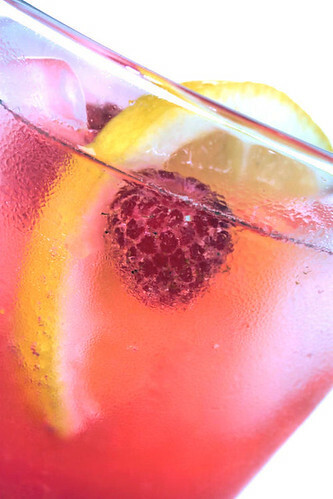 MMMMM,...your raspberry cooler looks so invuiting: great to enjoy in this hot summer! The picture with the raspberry in the glass is so cool. Looks so delicious. Nic, this looks really good! Good way to use that surplus raspberry stash! We're having a heat&humidity wave here and this seem perfectly refreshing for this time! You ever need help with your excess raspberries, I'm putting my hand up here, haha. This sounds so good! This is a beautiful summer drink! I love the first photo. It says cool and refreshing in a fun and interesting way. I will have to try this. There is an award over at my blog for you! By the way I changed my address to match the blog! Thanks everyone! I'd love to share my glut of raspberries with you all! Parker - I think the addition of a little vodka or other alcohol would be superb!! !